NWT Vintage Paddington Bear Plush from Harrods UK 2007 Darkest Peru + Suitcase! 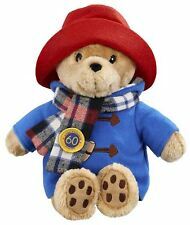 Kohls Cares Paddington Bear Plush Blue Coat Red Hat Teddy Sewn Eyes 14"
Paddington Bear Eden Toys Teddy Bear red coat blue hat Plush 8"
Paddington Bear Blue Hat Red Coat w/ Wooden Buttons Plush 10"
Paddington Bear made by. Don't forget to have a look around my store for other paddington bears. See below for details. Eden Toys Inc. A Plush. He measure approx. 9" Tall( sits 7.5"). RAINBOW DESIGNS PADDINGTON Bear 6" Mini Plush 2012 W/ tags - NICE! Size 60 cm or 23". Ruler on the photo is in cm. The object is always photographed from all sides. Always get exactly what is in the pictures! Typical Coalport factory marks to base. Paddington Bear x 7-11 Hong Kong. • The Paddington Bear can stand and the Jacket can be took off. World Travel Diary Soft Plush Teddy Doll. Camouflage Bear. 1 Plush Doll. ◊ Size : About 11 cm in height (with a chain at the top for hanging the bear). 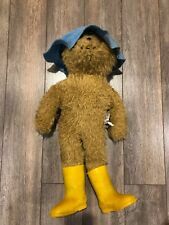 Vintage Eden Paddington Bear with Barkridges Bag Hat Boots and tags RARE 11"
Vintage 1981 Paddington Bear Plush Stuffed Animal Toy Blue Jacket Red Hat 14"
Paddington Bear 14” Plush Darkest Peru To London Beverly Hills Teddy Bear company 2002. Great condition with no stains or rips. SHIPS FAST IN 1 WORKING DAY OF PAYMENT! Comes from a smoke free and pet free home. All used items have been cleaned and sanitized for you. Returns Accepted in original condition within 60 days with return shipping paid by buyer. COMBINED SHIPPING AVAILABLE! CHECK OUT OUR EBAY STORE FOR MORE GREAT FINDS! CLICK THE DOOR ICON! Thanks for looking and we at 3 LEE SPREE are excited to sell to you and provide you with 100% satisfied customer service! Paddington Bear Movie Official Licensed Paddington Teddy Bear 8.5"
5 out of 5 stars - Paddington Bear Movie Official Licensed Paddington Teddy Bear 8.5"
1 product rating1 product ratings - Paddington Bear Movie Official Licensed Paddington Teddy Bear 8.5"
Paddington Bear x 7-11 Hong Kong. • The Paddington Bear can sit and the Jacket can be took off. Art Jam Artist Collection Soft Plush Teddy Doll. 1 Plush Doll. ◊ Size : About 11 cm in height (with a strap at the top for hanging the bear). Paddington Bear Movie Talking Plush Toy | Children's Paddington Bear Soft Toy. This large Paddington Bear red cotton banner is from Wright Tourist Products and is dated 1975. It has a pocket sewn into the top for a dowel so it can be hung. It is in very good condition, with no holes, tears, stains or odors. Late 1970s doll and 1973 children’s book (see photos). Blue hooded coat and yellow hat. He is in great easy used condition. Stand not included. 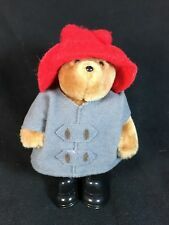 Paddington Bear Plush Blue Coat Red Boots Stuffed Teddy Bear 10"
This is the cutest Paddington Bear Red Felt Hat, Red Rain Boots and. A super cute 1972 large Padding bear by Gabrielle design. The condition of the bear is very good. The maker label is behind his neck. 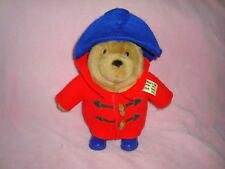 12" Paddington Bear dressed in his famous all-weather boots, hat and coat. Paddington is pre-owned. His front tag is missing half/do not know why. He is still a much loved bear. Otherwise, Paddington is in very good condition. Shows a lot of wear and fading.